Stop by Choices for lunch, dinner, or brunch, where this restaurant specializes in international cuisine. Dining is also available at the coffee shop/café, and 24-hour room service is provided. Buffet breakfasts are available daily from 6:30 AM to 10:30 AM for a fee. Enjoy a range of recreational amenities, including an outdoor pool, a sauna, and a 24-hour fitness center. This hotel also features complimentary wireless Internet access, concierge services, and complimentary babysitting/childcare. Feel welcome the moment you arrive at DoubleTree by Hilton Hotel Doha Old Town with a warm chocolate chip cookie at check-in. Ideally located in Doha’s dynamic business and banking district, this modern Doha hotel is just10 minutes from Doha International Airport and 6km from Hamad International Airport. Discover lots of cafes and restaurants nearby, and enjoy easy access to the Corniche, Doha Port and the Emiri Diwan Palace. Attractions including the Museum of Islamic Art and the Souk Waqif can be easily reached from our stylish hotel in Doha.With four meeting rooms, a spacious banqueting room, a reception area and a complimentary 24-hour business center, this Doha hotel is the ideal venue for business meetings and training events. Our professional staff and modern A/V equipment will ensure your function is a success.Our bright, spacious guest rooms feature high ceilings and floor-to-ceiling windows, offering wonderful city views. Relax in the comfortable seating area and stay connected with complimentary WiFi at the desk. Luxurious suites are also available at this Doha hotel, with a kitchenette and separate living and dining areas.Energize in the complimentary 24-hour fitness center or refresh in the rooftop swimming pool, as you take in magnificent views over Doha. Enjoy international and local specialties in the all-day dining restaurant, OPEN, and recharge with a coffee and a sweet treat in Barrista. Our relaxed Sky Lounge, Pure, is the perfect place to cool down with a fresh, healthy juice and enjoy a delicious, Mediterranean-influenced snack. The property offers 162 hotel rooms in varying sizes including Suite rooms, Junior Suite; interconnecting rooms, single rooms, double rooms. Horizon Manor Hotel also offers an extensive choice of conference and meeting facilities, two restaurants, a coffee shop, business center, two board rooms, and others state-of-the-art facilities and amenities. ?Our primary focus for Horizon Manor Hotel will be business travelers, Doha being the region?s most business-friendly location housing a significant number of global corporations. Being a hub of the MICE (Meetings, Incentives, Conventions and Exhibitions) sector, Doha attracts a significant number of global business travelers and we are confident that Horizon Manor will be an attractive choice for them, ?(Mr. Imran Ullah Baig General Manager) Commenting on the vision of Horizon Manor Group, he added, ?it is our vision to emerge as a world-class provider of international hospitality services, offering a consistent level of comfort to both corporate and leisure travelers.? With a stay at Best Western Plus Doha, you'll be centrally located in Doha, a 3-minute drive from Doha Corniche and 9 minutes from Souq Waqif. 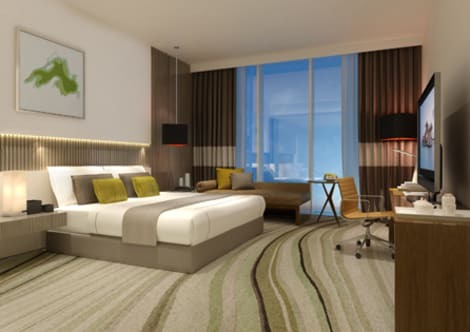 This 4-star hotel is 7.2 mi (11.7 km) from Katara Beach and 8.5 mi (13.6 km) from Villagio Mall. For lunch or dinner, stop by Musheireb, a restaurant that specializes in international cuisine. Dining is also available at the coffee shop/café, and 24-hour room service is provided. Buffet breakfasts are available daily from 6:30 AM to 10:30 AM for a fee. With a stay at Saray Musheireb Hotel in Doha, you'll be within a 10-minute drive of Souq Waqif and Doha Corniche. This 4-star aparthotel is 6.9 mi (11 km) from Katara Beach and 6.7 mi (10.7 km) from Villagio Mall.